PG&E Hit With $1.6 Billion Penalty For 2010 Calif. 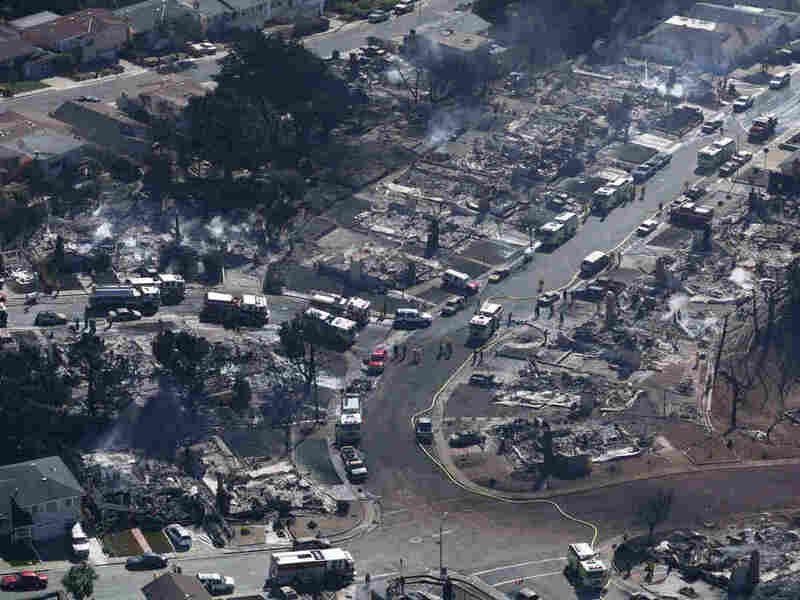 Pipeline Explosion : The Two-Way Pacific Gas & Electric Co. was ordered to pay the fine — the largest ever charged a public utility — for the San Bruno explosion and fire that killed 8 people and destroyed dozens of homes. A Sept. 10, 2010 photo showing firefighters and rescue crews working amid damage caused by the pipeline explosion in San Bruno, Calif.
Pacific Gas & Electric Co.has been ordered to pay a $1.6 billion penalty — the largest ever levied against a public utility — for a 2010 explosion in a gas pipeline it operated that killed eight people and destroyed dozens of homes in a San Francisco suburb. The five-member California Public Utilities Commission voted 4-0 Thursday to impose the penalty. President Michael Picker called for a larger review of problems at PG&E, a move that The Associated Press says "suggests the energy behemoth could be broken up." 'The commission will study 'the culture of safety' and organizational structure of Pacific Gas & Electric Co., which has its gas and electricity operations under a single corporate board and chief executive." "The commission's fifth member, Mike Florio, did not participate because he voluntarily recused himself after email messages came to light that showed private communications between Florio and PG&E executives in other cases before the commission." The Los Angeles Times says of the explosion five years ago in San Bruno that 58 people also were injured and 38 homes destroyed. "The PUC action, which had been more than four years in the making, requires PG&E to pay $850 million for improvements to its natural gas pipeline system. "Another $300 million will go to the state's general treasury, $400 million will be refunded to PG&E gas customers as a one-time credit and $50 million will pay for a variety of safety activities by PUC staff and contractors. "The entire $1.6 billion fine would be paid for by the company and shareholders — not by ratepayers." An earlier version of this post incorrectly stated that California Public Utilities Commission President Michael Picker abstained from the vote. It was Commissioner Mike Florio who did not participate.